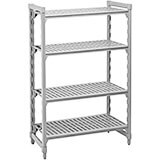 Our stationary shelving starter units are available in different dimensions. You can opt for the best match here, depending upon your storage area and requirements. All you need to do is to select the desired height and number of shelves, depth and length! These starter units feature a variety of weight bearing capacities. They are easy to assemble and get adjusted in seconds. Our pre-configured shelving units include all the components needed to build a stationary shelving unit saving you money instead of buying individual components. They feature a smooth polypropylene surface without any welds or crevices. 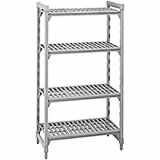 These Stationary Shelving Starter Units are resistant to rust and corrosion and are ideal for use in wet as well as dry units. Their shelf plates come protected against mold, fungus and bacterial growth, thanks to the antimicrobial, silver-ion technology. 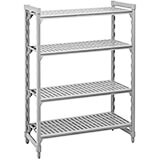 Shelving Starter Units, 64" High with 4 Shelves. 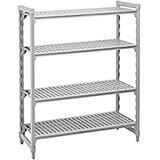 Shelving Starter Units, 64" High with 5 Shelves. Shelving Starter Units, 72" High with 4 Shelves. Shelving Starter Units, 72" High with 5 Shelves.